How can you contact someone privately through Twitter? You can DM them – but only if they follow you, or have “receive DMs from anyone” turned on (and lets face it, most people don’t). If the DM doesn’t work, you are into the “can you follow me so I can DM you” shenanigans. This can be a problem – because you have to reveal to anyone who is following both of you (or anyone who looks at your “tweets and replies” column) that you want to talk to them. Imagine you are a police force wanting to privately message a crime victim through Twitter. The very act of sending the “can you follow so I can DM” message is enough to tip off any watching journalists that there is something juicy about the victim of crime – even if it is not exactly clear what it is. The concept of “Dark Posts” is fairly well known on Facebook. They are advertising posts that don’t appear on your pages timeline – they are only seen by users targeted by the ad. Dark posts aren’t such a well known thing in Twitter…but they do exist and can be used to send (almost completely) private messages to anyone on Twitter. Start by visiting https://ads.twitter.com/. Twitter will keep begging for a credit card to pay for ads – but you can ignore the whining! 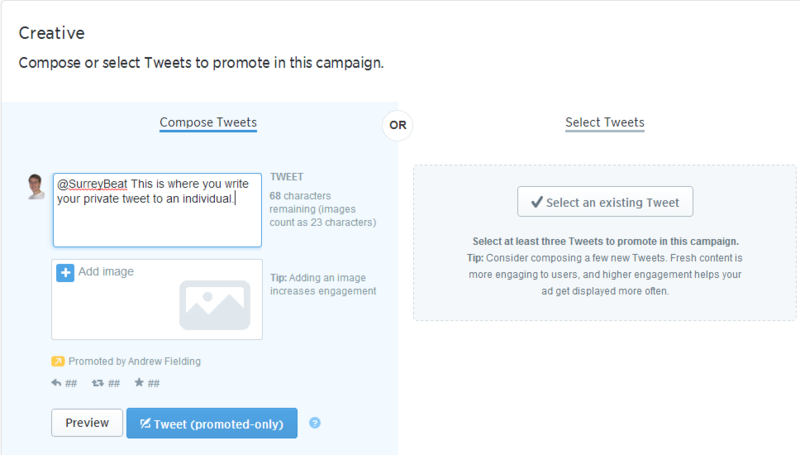 Click “create a new campaign” and optimise for “tweet engagements”. This process creates the tweet , ready for you to promote. AT this point Twitter would like you to pay them some cash and promote the tweet…but we’re done here. 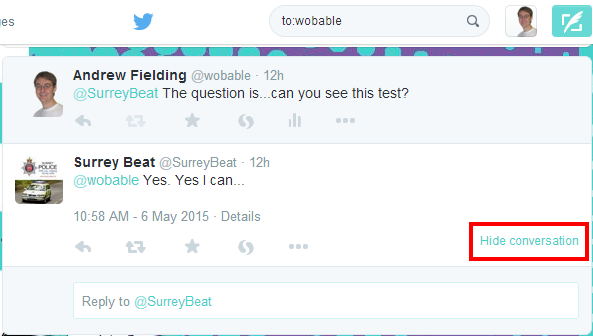 @SurreyBeat This is where you write your private tweet to an individual. The dark post won’t show up in the search results – even if you search for “from:wobable” or “to:surreybeat” – UNTIL they reply. Once a dark tweet is replied to, it can be found (indirectly) through search (assuming that the reply is not a dark tweet as well). This is done by finding the reply, then viewing the conversation. Also, note that deleting the advertising campaign doesn’t delete the dark tweet – you need to do that from the tweet itself (click on the date!). To be honest this is not a technique I can see getting enormous amounts of use…but @Christian_Aid could have used it as another way of messaging every police force in the UK without spamming their 71K followers. More about who sees promoted tweets (from Twitter itself). You can also schedule a promoted tweet (though you have to add a credit card, there is no payment required).